President Bush promised “bone-crushing happiness” in his second term. 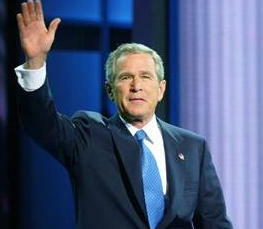 New York (AP)-In a powerful speech that brought delegates at the Republican National Convention to their feet, President Bush promised a "devastating second term" if re-elected. "Mr. Chairman, delegates, citizens, I am honoured to accept your nomination," Bush said before a crowd of thousands of party faithful at Madison Square Garden on Thursday evening. "Together, I am convinced that we will give the American people a cataclysmically triumphant tomorrow." The speech built on a 6 September interview in Time Magazine in which the president described the war in Iraq as "catastrophically successful"-meaning that the military had achieved its goals so quickly that the US-hating Iraqis couldn't surrender properly. "I believe that bone-crushing happiness is just around the corner for the American people," Bush said on Thursday. "This happiness will be so devastating, it may cause some Americans to cry out in pain," he added. In the half-hour speech Bush outlined in broad strokes ambitious plans for the economy, the deficit, and the ongoing war on terror. To protect American jobs, he proposed subsidizing oil and defence companies with amounts of money so large "it will make Americans dizzy." He pledged to trim the deficit through deep cuts in social spending that would leave "the nation's poor are gasping with relief." And he promised to fight terrorists with tactics that "will shatter the American people's freedom and build a new, greater system from the broken shards." Speaking from his vacation home in Nantucket, Democratic rival John Kerry painted the speech as largely lip-service to the American people. "I believe I would be far more tragically effective if elected," Kerry promised. But his words fell on deaf ears at the convention, where President Bush's speech met with wild applause and cheers of "four more years" from the Republican delegates present. Pollsters are already estimating that the speech's bold language will give Bush a hefty post-convention bounce. "This speech could give Bush the critical points he needs to win this tightly fought race," says pollster Darrick Bolton of the Gallup Organization in Princeton, New Jersey. "It's a disastrously optimistic vision for America's future," says Sally Gravles, a delegate from Tulsa, Oklahoma. "Just thinking what he will do to the American people if re-elected sends shivers down my spine."